Sunday morning we awoke to the pattering sound of rain. We quickly got ready to move on to North Carolina and were grateful that the day before Brad had cleaned off the slides. 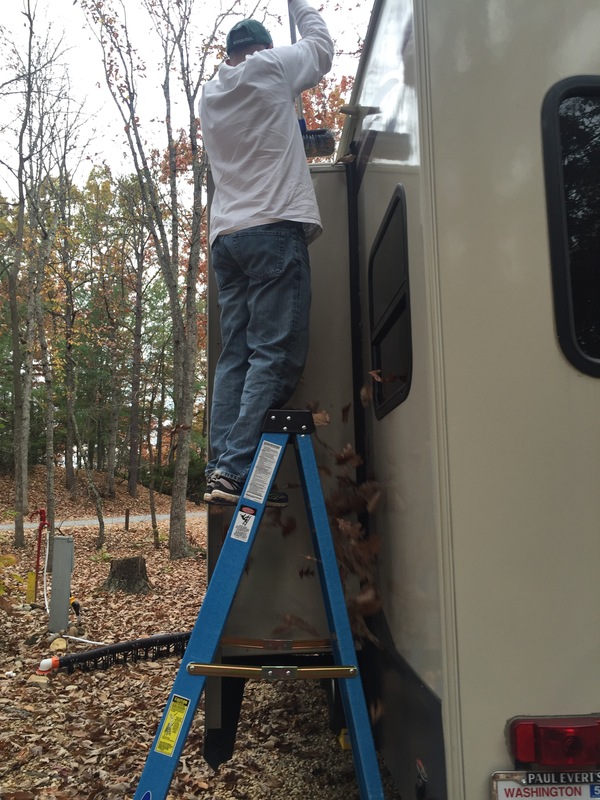 Note: slides are wonderful because you get a lot of extra room when you are parked, but when the RV is under falling leaves for two weeks, the top of the slides have to be cleaned off otherwise all that stuff will fall into the house. Something we never thought about until recently. LOL! On our drive leaving Virginia, we hit some fog in the mountains. The signs kept saying fog in the mountains but it wasn’t until about ten miles after the signs that we actually hit the fog. It was almost like being in a whiteout where we couldn’t see anything around us. We slowed down and as the fog slowly started to lift, we saw a car in front of us.Keeping our distance, we followed them. Thank goodness the fog only last a few miles, but it was a little nerve-wracking none the less. This is the first Thousand Trails campground we have been to. We got a trail membership when we purchased our 5th wheel and we picked the Southeast zone, which is Alabama, Florida, North Carolina, South Carolina, Tennessee, Texas, and Virginia. All the other campgrounds we have been to assigned us a campsite. 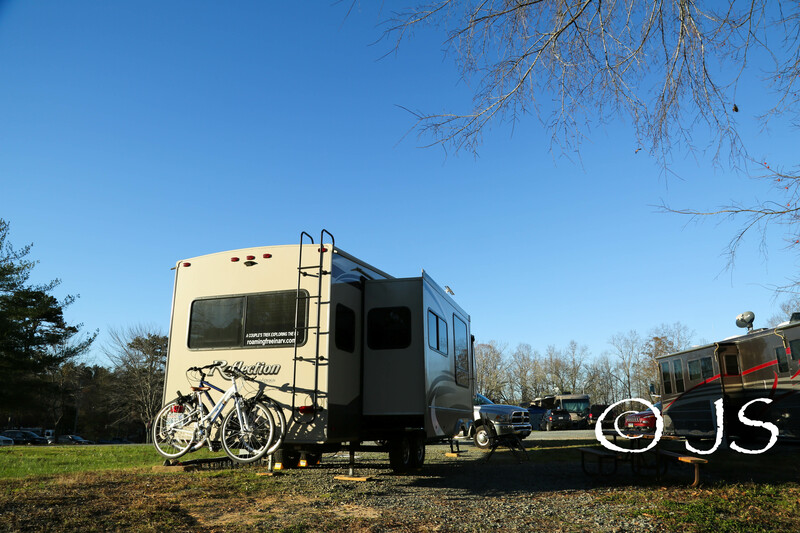 At Thousand Trails, it’s first come first served and you pick your campsite. I’m a little iffy if I like that or not. It was nice to pick our own site, but when it was raining and we had been driving for five hours, the last thing we wanted to do was drive around the campground looking for a site. We will see how we like it as we continue on. The rain continued throughout the week. We got a few hours break on Thursday, but it continued till Tuesday morning. I almost called this blog post “the week of nothing” because that’s what we did the past week, nothing. We got back into the routine of working out with the TRX after taking a week off from donating blood and we kept up with our steps but that’s it. I guess we all just need weeks like that, where we do nothing but feel refreshed from doing nothing. I think the gray skies and rain didn’t help either. We just wanted to make chocolate chip cookies and watch a movie. Saturday we met up with Brad’s parents to watch the MSU game (of course!) 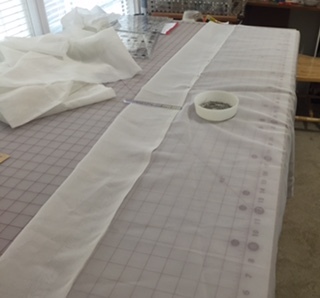 and my mother-in-law and I worked on making curtains for the 5th wheel. I kept all our old curtains from Washington so we cut and hemmed them. I am so excited to take down the brown valances and add some color to the house! It’s so brown right now and adding curtains will make the space homier. This coming week we continue to stay in North Carolina and my younger sister is visiting. We have lots planned so be prepared for a more exciting post next week! 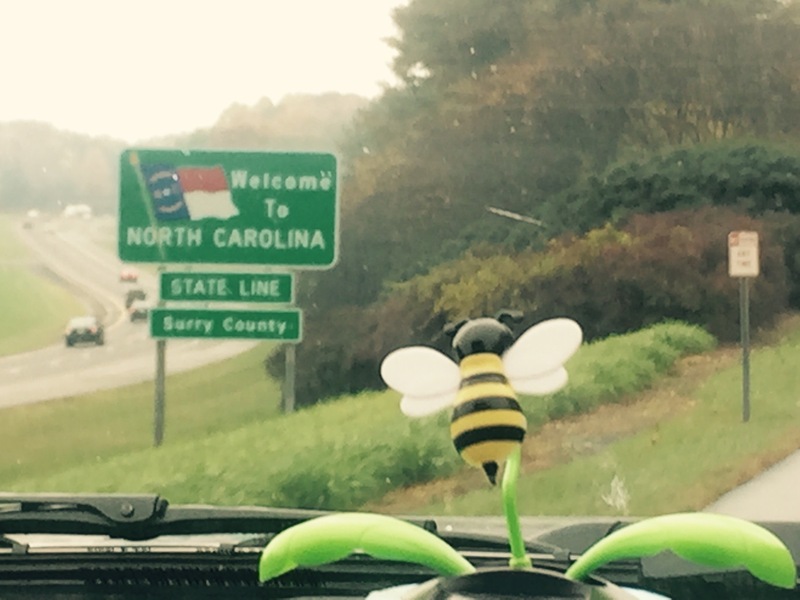 Welcome to the Carolinas! Nick and I relocated to Charleston about a month ago. We have sun and 70s in South Carolina. I hope thatyou find dry weather soon! Thanks Janine! Nice to hear from you. We were told that the weather we were experiencing is rare in NC. South Carolina is our next stop. I have only driven through SC so I’m looking forward to exploring the state. I don’t think we will be traveling up to Charleston, otherwise I would suggest meeting up for tea. Do you like it? Do you have access to television and can you watch The Weather Channel for local weather conditions? Hi TC! We have a TV in our 5th wheel and if there is cable at the campground we can get the local channels. Otherwise, we use the Weatherbug app on our phones. Cheers! Hope the weather gets better. Hi Jim and Jan! We remember you both. We have met only one other Reflection owner besides you but we have had a lot of people ask about Grand Design. Thanks for the comment! Bar Harbor was great and we loved Acadia. Happy travels! The campsite looks familiar 🙂 Can’t wait to see your new curtains up!